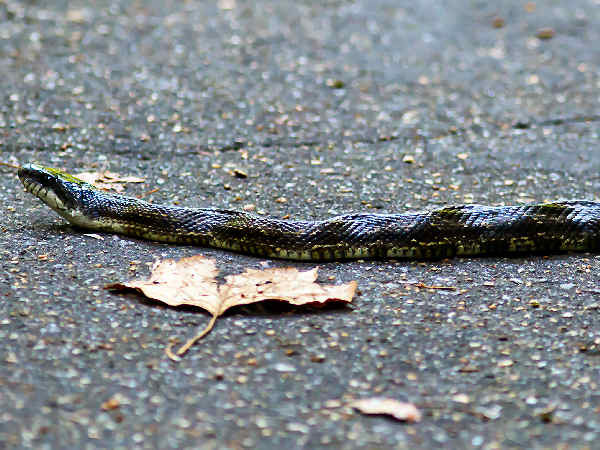 Due in large part to the milder climate of the Lower Peninsula, Michigan snakes rank among the most diverse group of snakes for all the northern border states. Depending on the source, Michigan snakes consist of nineteen species. 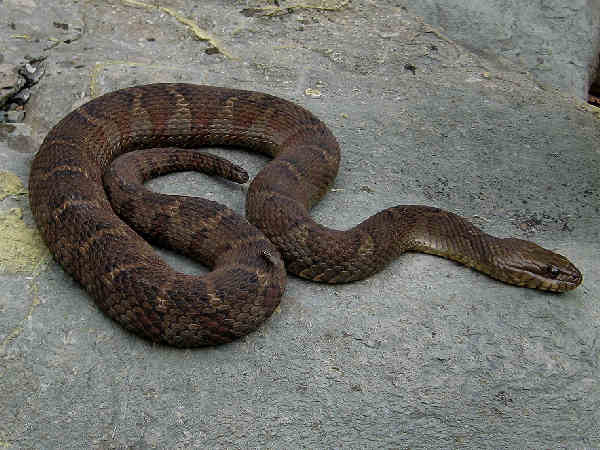 Eastern Massasauga (Sistrurus catenatus) are Michigan’s only venomous snakes. They are associated with water and forest areas. While Michigan documents them in most of the Lower Peninsula counties, their population levels widely differ according to county. Here’s a quick overview of the nonvenomous Michigan snakes. 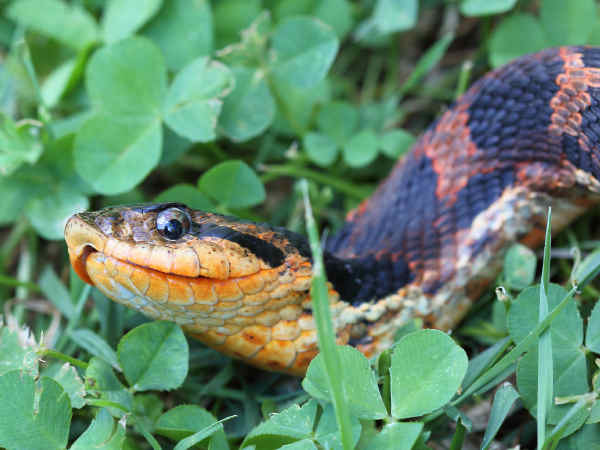 The green button leads to pages providing additional snake pictures and information. 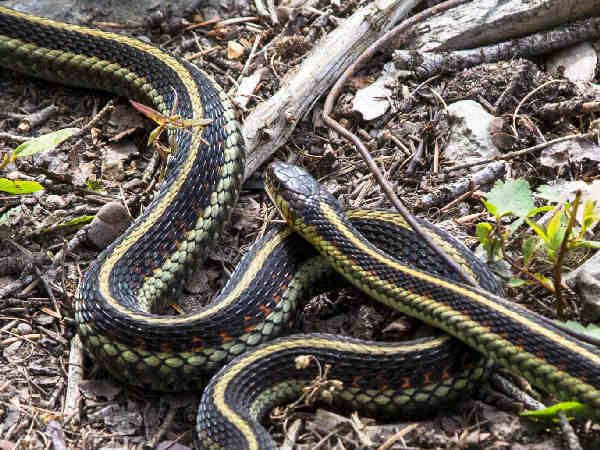 Common Garter Snake in the picture is a rather bland looking species and easy to identify basically because it’s the primary species in Michigan. 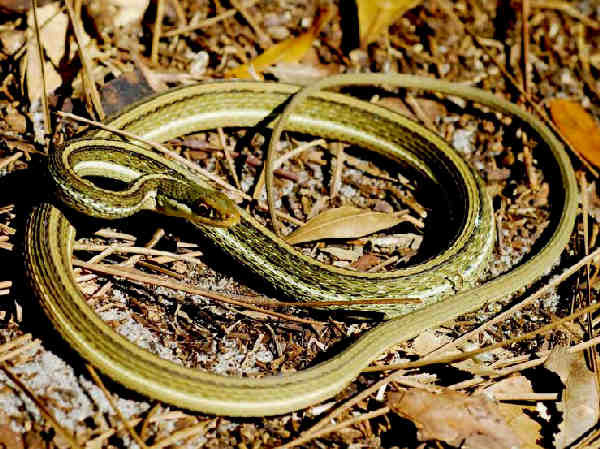 Michigan lists the Butler’s Gartersnake (Thamnophis butleri) as a species of Special Concern. It is found along the southern most areas of the state. Residents can note bold stripes along the body. Ribbon snakes refers to a group of snakes in the genus Thamnophis, differentiated by the presence of longer tails and a light patch in front of the eye. 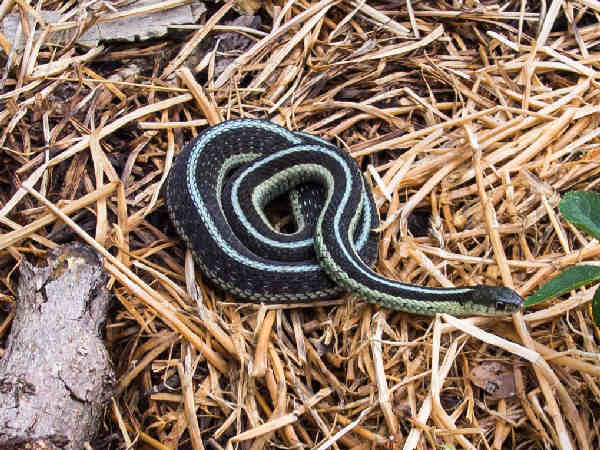 Eastern Ribbon Snakes (Thamnophis sauritus) share those same physical features. While mostly found in the Lower Peninsula, they also have small populations in the Upper Peninsula. The common snake names such as racers, coachwhips and whipsnakes often get categorized under the genus Coluber. Their species are common throughout the United States and share some physical and behavorial traits. Most if not all species tend to be comparatively thin and very fast movers. In fact eleven different subspecies inhabit almost every state in the lower 48 states. Color is a common name applied to many of the species as well as the Black Racer. 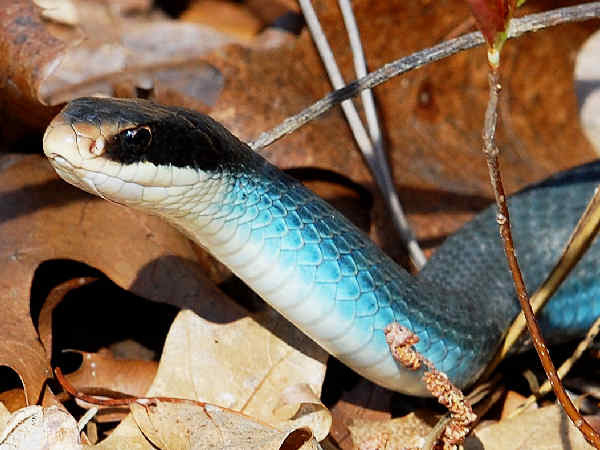 Blue Racers, for example are common around the Great Lakes region, including Michigan. They live in multiple habitat in the southern one-third of the state. Eastern Hognose snakes (Heterodon platirhinos) can assume a variety of colors and are the most wide ranging of species. Eastern Milk Snakes (Lampropeltis triangulum) are very adaptable snakes, inhabiting multiples areas from fields to forests to farm, mostly in the Lower Peninsula. 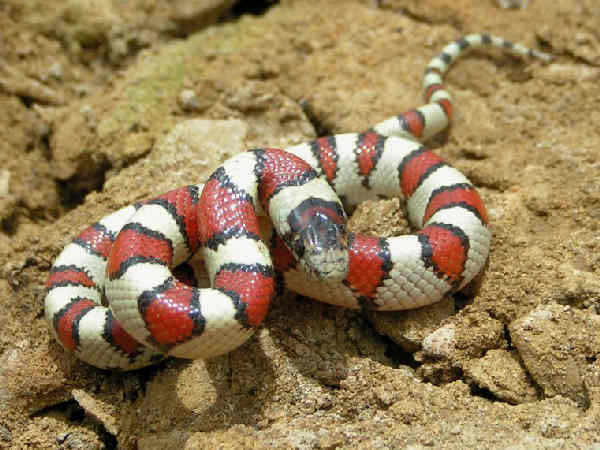 Finding Milk Snakes in the east can be as easy as taking a hike and flipping over a few big rocks or logs. The can grow up to on average about three feet in length and the red to orange to dull rust color of the bands makes them easy to spot. The Northern Watersnake (Nerodia sipedon) is probably the species with the widest range. It’s found in all states east of the Rocky Mountains. Body color changes depending on age and location, so often it’s not the best field identification clue. Knowing that it’s the only species in the state is the best clue. Plain-bellied Watersnake (Nerodia erythrogaster) also go by the name Copper-bellied Watersnake. Michigan lists them as endangered with only a few populations recorded along the southern border. Gray Rat Snakes inhabit areas in southeast Michigan, mostly around the Lake Michigan region, and never in large numbers. It’s listed as a species of concern in the state. 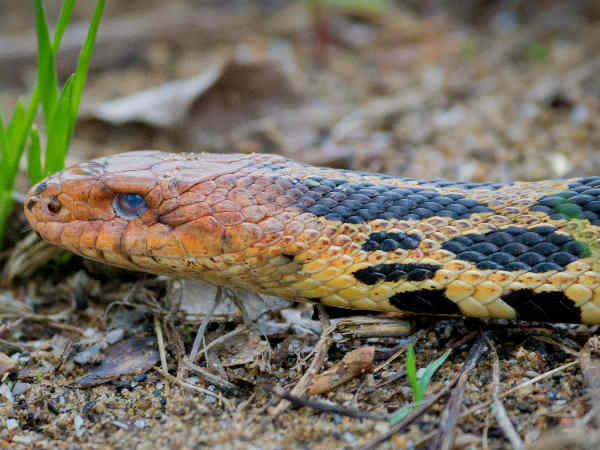 Two Fox Snake species inhabit Michigan, each with different habitat preferences. 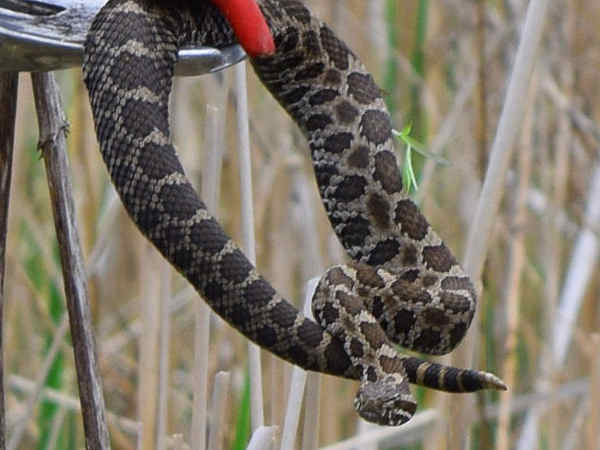 Western fox snakes prefer the drier areas around forests, prairies and pastures. Eastern Fox Snakes are fairly large snakes that can grow up to five feet in length. The inhabit the wetlands areas around the Great Lakes, and are recognized as very good swimmers. They are listed as threatened in Michigan. Here’s a quick lit of additional Michigan snakes. Please press the snakes button at the top of the page for additional information.